What Is 1:24 or Half Scale? One twenty-fourth scale (1:24) is a popular scale for collectors who want to integrate all types of models, miniatures, and toys into their collections. This scale is close to G or Garden Railway scale (which ranges from 1:20 - 1:22.5) and is popular with dolls house collectors, who often build things for children's dollhouse toys and collections in 1:24 to match with toys like Playmobil and Calico Critters (Sylvanian Families) as well as collectors dolls houses using this scale. This is one of the larger scales for detailed die-cast cars and plastic car models, as well as the largest traditional slot car size. It is also a popular smaller size for model horse collectors, as Breyer "stablemates" are on this scale. It is still a good size for detail and is easy for children to handle, while it takes up much less room than the larger 1:12 scale common for dollhouses. Toy trains can use "G" scale track and have passenger cars which will seat small dolls, making this scale easy to integrate with the entire Playmobil and Calico Critters range of toys, as well as many railroad figures, farm animals, and some die-cast vehicles. It is a common scale for model villages due to the wide range of subjects available. The term "half scale" is not a true indicator of the scale, half-scale is actually 1:2, rather than 1:24. In the case of 1:24 scale dolls house builders refer to it as "half scale" due to it being one-half of the "regular" dolls house scale of 1:12. How Can I Tell If My Miniature or Dollhouse Is 1:24 Scale? For a 1:24 scale dolls house, the 3 1/4 inch doors in scale, would compare to full-size doors which are 3 1/4 x 24 inches large - if you are reporting the dolls house size in inches the ratio is worked out in the same units) 90 inches or 90/12 = 7 1/2 feet. An adult male figure or doll in this scale is usually between 2 1/2 and 3 inches tall, or the equivalent of 5ft 6in. to 6 feet tall. 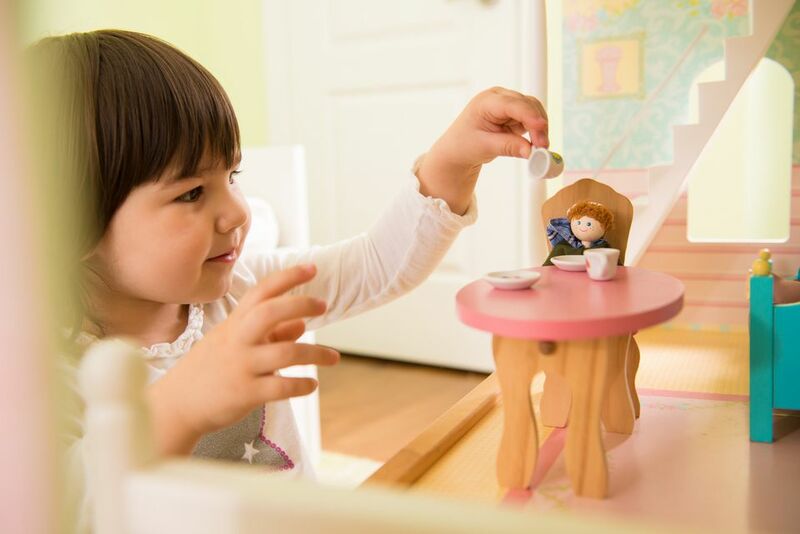 Measure the height of your figure to see if it fits with 1:24 scale or measures the height of doors on a dollhouse to see if they are within the size range on this scale. 1:24 scale, a reduction of the popular 1:12 scale in dolls houses was a very easy scale to use when inches were commonly divided into twelfths on most rulers. With modern imperial rulers being divided into 1/16ths instead of 12ths it is not quite as convenient to use, although rulers in 12ths are still available. It is not as useful a scale if you are working in metric measurements, as the ratios are not as easy to switch mentally. One centimeter is equivalent to twenty-four centimeters, but as 24 centimeters doesn't translate easily to any common segment of metric measure, the scale is slightly more difficult to mentally compute.